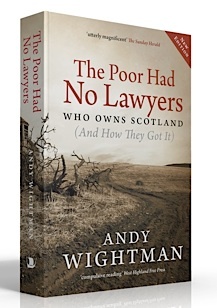 The Poor Had No Lawyers provides a fascinating and in depth account of how Scotland’s vast commons were converted into private ownership through a variety of legal devices. It examines the legacy of Robert the Bruce, the Reformation and municipal corruption. It exposes the motives behind the laws of land registration and prescription. 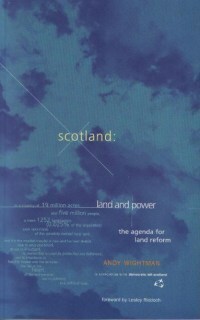 Over 32 chapters, it explores everything from the story behind the Cuillin sale, the scandal of agricultural subsidies and the use of a non domino titles to legal reforms of succession law, the ongoing struggle to protect remnants of Scotland’s commons, the muddle that is the community right to buy and why the current SNP government has done so little on land reform. Along the way it provides authoritative statistics on who owns Scotland today and reveals the remarkable story of how the ownership of every corner of Scotland was mapped and documented in 1910. NEW UPDATE EDITION published 18 APRIL 2013 or e-book. Available from all good bookshops or direct from Birlinn. The Guide explains how to use sources such as the Register of Sasines, Land Valuation Survey 1910 and the National Farm Survey to identify community land rights as the first stage in a process of asserting and restoring rights that belong to the people.